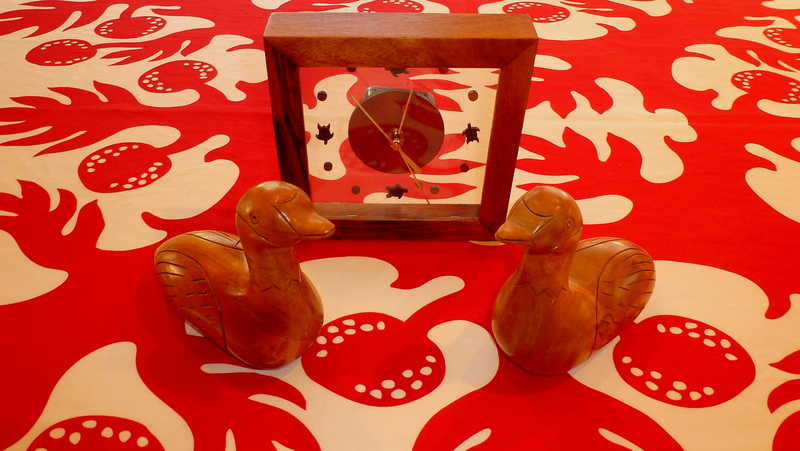 Clock and wooden nene geese made from koa wood. Acacia koa is one of the most prized woods in the world. But people in Hawaii more simply know it as koa. It naturally grows nowhere else in the word except in Hawaii. The ancient Hawaiians used this fine medium density hardwood to build canoes, paddles, spears and surfboards. Koa wood quality is somewhat similar to black walnut. At one time, the wood was so sought after, it was known as the wood of kings. Additionally, craftsmen valued the wood for its shining luster after they finish and polish it. Today, people also prize koa wood for use in ornate woodworking as well as in very high end furniture. As a tonewood, craftsmen also use koa for making ukuleles. One can find the best koa wood today on the Big Island of Hawaii. They typically grow at higher elevations between 2,500 to 6,000 feet above sea level. However, this was the same elevation where there were many cattle ranches. As a result, ranchers cleared many of the koa forests when they started ranching operations the area. Additionally, what makes this tree harder to grow is that cattle like to eat the seed pods from this tree. Feral animals such as wild boars also like them. These factors make it even harder for the trees to reproduce. Today, Federal, state and private agencies are making an effort to restore the koa forests in Hawaii. They are planting new trees for both commercial and conservation purposes. This is good new for a number of reasons. Those that love the beauty of Hawaii’s forests will certainly appreciate this. Also, those that admire the beauty and the art that people can create from koa trees will also be grateful.